The Indigenous Youth Engagement Trade Initiative project was created to promote, engage, support and explore opportunities for Indigenous youth within trades. The Indigenous Youth Engagement Trade Initiative (IYETI) is a collaboration between Skills Canada New Brunswick, the Joint Economic Development Initiative (JEDI) and the Department of Post-Secondary Education Training and Labour (PETL). We’ve decided to run this contest because we believe that our new logo should be created by youth for youth. We’re really excited to see the creative submissions from the Indigenous youth in our communities and we hope that all of you that participate have fun coming up with new ideas. 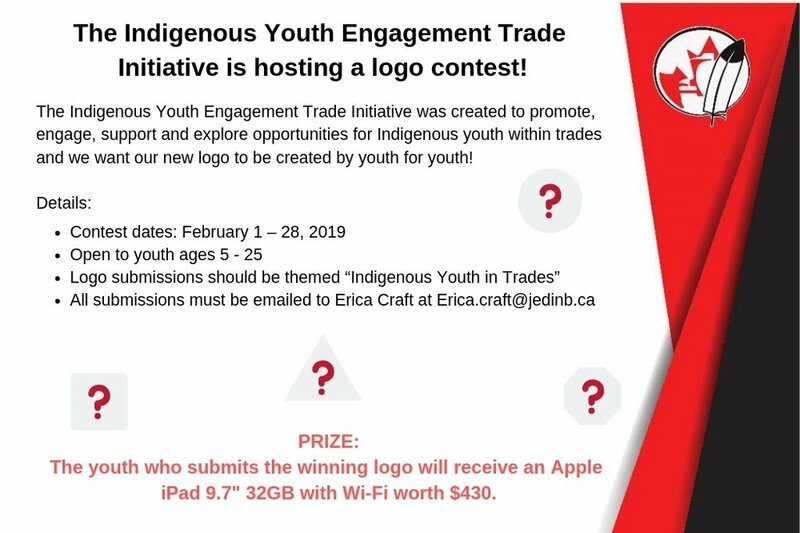 The contest will run from February 1 – 28, 2019 and the theme of all logo submissions should be “Indigenous Youth in Trades”. The logo contest is open to youth ages 5 – 25, participants can submit up to 3 separate logo designs in total. The youth who submits the winning logo will receive an Apple iPad 9.7" 32GB with Wi-Fi worth $430. All entries will be reviewed by a panel of judges. Judges will determine the winner based on creativity, visual appeal, usability (ability to be used for promotional purposes), and relevance to the theme “Indigenous youth in trades”. Submitted logos cannot contain any copyrighted material, as well, all submitted logos must be original and created by the youth who has submitted the logo. All logo submissions will become the property of the Joint Economic Development Initiative (JEDI), this means that all logo and copy submissions release any and all IP rights (copyright, trademark and other) to JEDI. JEDI will use the winning logo in print media, social media, and for other promotional purposes. JEDI reserves the right to reject any and all entries. JEDI reserves the right to request reasonable minor design modifications from the proposed winner. JEDI has the right to alter, modify or edit the winning logo as it deems necessary. All contestants must agree that their submissions and names can be used for promotional purposes.